Fire breathing is a dramatic effect created when a person blows a spray of fuel over a flame. The result is a plume of flame jetting from the fire breather’s mouth. The effect is simple to achieve, but not so easy to do safely. Most performers use kerosene, lamp oil, or naphtha. These chemicals are toxic and carcinogenic. The key is to switch from a toxic flammable fuel to one that is non-toxic and nonflammable. Using a safe chemical prevents the negative health effects of using hydrocarbons and the risk of blowback, which occurs when a flame burns back toward the firebreather’s mouth. 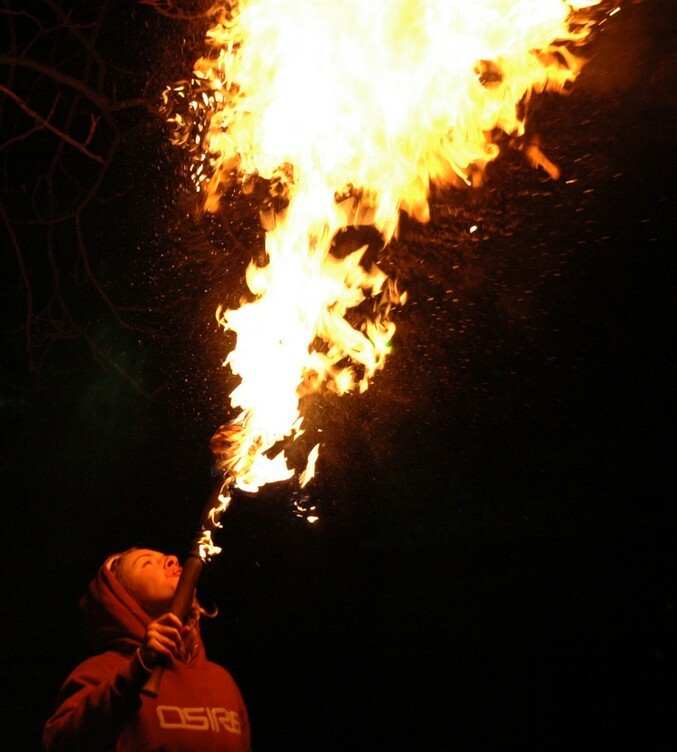 The “safe” method of firebreathing uses corn starch, powdered sugar, or powdered non-dairy creamer as a fuel. These materials are safe enough to eat. If you apply a flame to any of these substances, they won’t burn. However, if they are dispersed into a fine powder, they ignite. This is because these materials all contain carbohydrates. The fine powder burns instantly, so the effect doesn’t travel back toward the performer. The best flame for this project is a small torch. It’s too easy to blow out a candle or lighter flame. Fill your mouth with a big scoop of corn starch (or your desired safe fuel). Be careful not to inhale it because it’s a fine powder. Now, all you have to do is blow the corn starch through the flame. This takes practice. Basically, you want to whistle or spit the fuel into the flame. Take care not to blow the fuel toward a person, pet, or flammable object. Easy, right? Now, grab that glass of water. Swish the water around your mouth to rinse out the starch or sugar. If you’re wondering what to expect, I recruited family members to test this project. This project is literally playing with fire. It should only be performed in an open area away from flammable materials. It should only be performed under responsible adult supervision. This is fire, so there is a risk of getting burned or starting a fire. Have a fire extinguisher or running garden hose ready, just in case. If you have long hair, tie it back. It’s better to wear natural fibers (cotton, silk, linen, wool) rather than synthetics, as they can melt in contact with a flame.